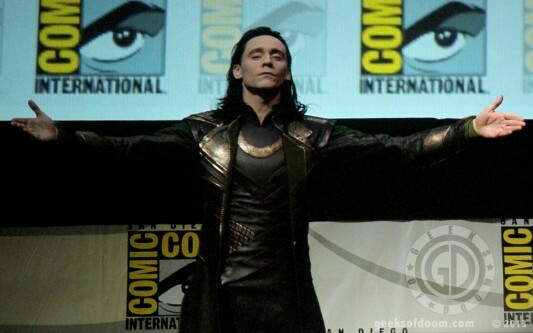 Tom Hiddleston has developed quite the fan following for his work portraying top Marvel villain Loki in the Thor movies and The Avengers, but it may come as a surprise to you to discover that Hiddleston did not initially go out for the role of Loki. He actually first auditioned for the lead role of Thor, which ultimately went to Chris Hemsworth. With the Blu-ray for Thor sequel Thor: The Dark World coming next month, a peek at one of the special features has surfaced online. The peek comes from a Thor Screen Test in which a blond long-haired Hiddleston is seen auditioning for the lead role as the God Of Thunder, even wielding the mighty hammer Mjölnir. You can see what Loki looks like as his brother Thor here below! Unfortunately a video of the special feature itself (or at least a preview clip) has not yet been released, but these GIFs do the job for now.